Concept GLB to debut in a couple of weeks. 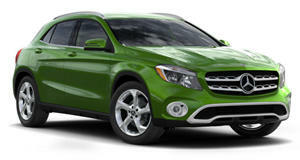 Mercedes-Benz, like most automakers out there, has been steadily expanding its range of SUVs. But it's also been growing the family of its smallest models. And it still has at least one more in the pipeline. This interior rendering previews the Concept GLB that Mercedes will unveil at the Shanghai Auto Show later this month. The German automaker briefly shared the teaser via social media before quickly taking it down again, but we managed to grab the image before it did. And judging from what little we can see, the cabin environment, at least, will look rather slick. Though we can only see a portion of the cabin, the Concept GLB clearly takes a different approach to the interior of the GLA, with a more horizontal dashboard detached from the center console and a floating screen extending to display both instruments and infotainment functions. The open-poor wood trim, combined with the terracotta leather and aluminum accents, lends it a clean but rugged atmosphere. While the nameplate suggests the GLB will slot between the GLA and the GLC, what we're actually expecting to see is something of a baby brother to the G-Class – which is, to say, a boxy and rugged sport-ute. Tellingly, though, the windscreen appears just as steeply raked as the GLA's, instead of the more resolutely upright G-Wagen's – or the Ener-G-Force concept shown in Los Angeles a few years ago (and pictured above). 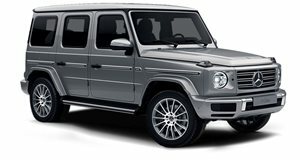 Unlike the body-on-frame G-Class, the GLB will mostly likely be based on the same unibody, front-drive platform that underpins the A-Class sedan and hatchback, B-Class minivan, CLA four-door coupe and shooting brake, and GLA crossover alongside which it will anchor the bottom end of Benz's lineup. Suffice it to say, we're looking forward to seeing more when the show opens on April 16. Although, that may be because it's more of a hatchback than a full-on SUV.